Somewhere on a whiteboard in a classroom at the Universities of Shady Grove, swims a fish. 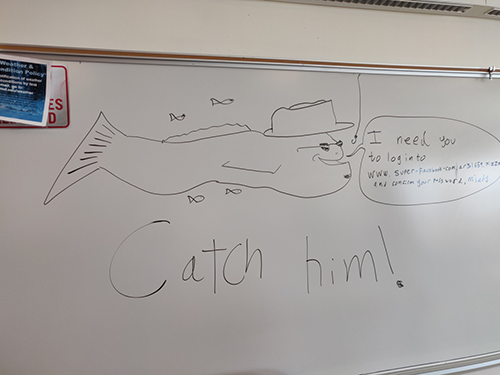 Drawn in black marker, complete with a fedora, sunglasses, and a goatee, the sketchy-looking ichthyoid intones into a word bubble: “I need you to log into www.super-facebook-com.ar31659.pizza and confirm your password, m’lady.” Beneath it, the caption: Catch him! While this cartoon fish (one of several) may not have made it into the Jupyter Notebook presentations, it indicates some of the fun participants had at the “Catch the Phish: An AI Capture the Flag Event,” on November 10 in Rockville, Maryland, as they learned new concepts, brainstormed how to solve problems with machine learning tools, and collaborated with their team members. “This challenge was a partnership between MITRE, the Universities at Shady Grove, and the Cybersecurity Association of Maryland, and was aimed at creating awareness of how artificial intelligence could be applied to cyber problems,” shares Michael Balazs, principal technology integrator and one of the leaders of Generation AI Nexus, an educational initiative that aims to expose all students to the power and pitfalls of AI independent of their fields of and inspire them to solve national problems. As originally conceived, the challenge was a way to exercise an environment for rapidly applying machine learning and AI to big datasets for real-world problems, on behalf of Gen AI. But Catch the Phish accomplished more than merely exposing students to MITRE technology. 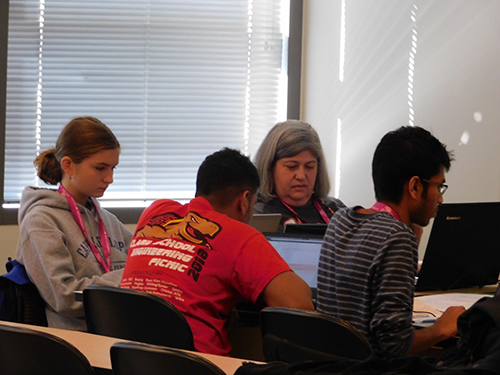 The event enabled a diverse group of learners to tackle a meaningful problem, learn new skills, engage their common sense, and interact with a roomful of peers and MITRE subject matter experts. To this end, two dozen participants from colleges and high schools across D.C., Maryland, and Virginia spent their Saturday working on the problem of phishing—a cybercrime in which a person is contacted (usually by email) by someone pretending to be a legitimate institution in order to steal sensitive information from the person. 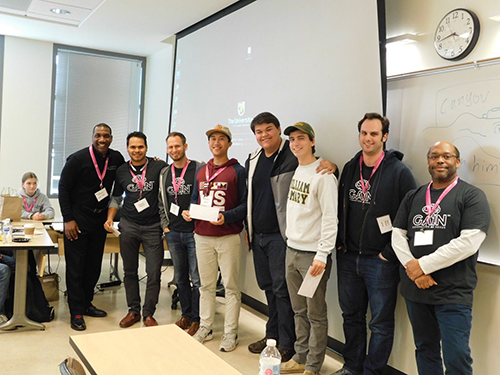 After settling into their teams, participants made their way into the Generation AI environment, courtesy of Reggie Carey, the event’s technical lead. As they began exploring a 6,000-item dataset curated by challenge designer Eric Harley, teams built a model to distinguish benign URLs from malicious URLs. Four hours and many conversations later, they stood in front of a packed room to share their approach and results with students, mentors, judges, hosts, and prize sponsors. For MITRE itself, the challenge enabled Gen AI to sign up a new academic partner, the University of Maryland Baltimore County and also the opportunity to expand this partnership to the entire University of Maryland’s system’s through the Board of Regents, which oversees the education of more than 170,000 students. As UMBC and our other early adopters develop curricula to give teachers and students access to artificial intelligence tools and curated datasets with MITRE’s help, these members of the Nexus will open doors for their students to help solve problems of national importance, be considered for internships and jobs in government and industry, and drive the development of the AI economy. Amanda Andrei is a computational social scientist in the Department of Cognitive Sciences and Artificial Intelligence. She specializes in social media analysis, designing innovative spaces, and writing articles on cool subjects. Marilyn Kupetz curates the Knowledge-Driven Enterprise blog and supports Generation AI Nexus in various capacities. Having lived and worked in six countries, she helps her colleagues explain complex technical material in terms that mere mortals can understand.